Kieran Andrews: “Cycle touring is way more than riding bikes. It’s about quiet roads, unique experiences and beautiful places. That’s what we’re all after.” While Kieran is quite content with just heading down an unknown road to see where it leads, it may not be your ideal decision when trying to plan a route with a limited time span. His main suggestion during his talk was to use MapMyRide.com as both a planning tool and a progress meter. Through the website, you can pick prospective cycling destinations (or find ones in your own area that others have recorded) to see both via map and elevation how challenging it may be, the road type (gravel, paved, etc.) and how much traffic it may see. Louisa Mursell: Projects Director with Transportations Options, which is a non-profit organization that has been around for 20 years that helps to further develop sustainable transportation. Lately they have been working on tourism initiatives including cycling. Amongst their programs are Bike Train (to increase bike options for cyclists in Ontario), and Park Bus (bus transit to Ontario Parks locations). Through the Welcome Cyclists network, they have discovered that cyclists were not fully satisfied with lodgings in areas. You can visit the Welcome Cyclists website to help plan trips, and find accommodations that are bicycle friendly and provide secure bicycle lock-up area. The accommodation must have local cycling maps or websites to help with this information, as well as access to repair tools or be in close vicinity to a bicycle shop. Healthy food and free access to water is also key as well. Prospective businesses that would like to join just have to sign up online (for free) and attend a Welcome Cyclists seminar. There are currently 65 businesses in the Kawartha-Northumberland-Peterborough area (most are in Northumberland County). Susan Sauvé: Talked about touring through France by bicycle. She found the hospitality very good along with growing places that have public laundry and Wi-fi (although because of the differences in power outlets, sometimes it was tricky to charge your devices). Sue was pleasantly surprised to find so many bicycle trails and bicycle sharing programs throughout Paris. The three then fielded questions from the audience about cycling touring. John McMullen let us know that that because of healthy lifestyles, and the effort to reduce greenhouse gasses, trails have become a major part of the Selywn township masterplan. The four main trails are the Lakefield Trail, the Bridgenorth Trail, the Ennismore Heritage Trail and the Trans-Canada Trail, but there are also many additional popular hiking trails. They have already had public consultations—through surveys and open houses—from which they learned that Bicycle lanes were one of the higher ranked things, followed by linking the areas together. Displayed around the room were maps of each of the hamlets of Selwyn township. John asked everyone to put a sticker on the area in each hamlet where they would like to prioritize improvement. Tegan Moss from the P-BAC (Peterborough Bicycle Advisory Committee) and Peter from Green-Up are trying to create a cycling culture here in Peterborough by providing input into both infrastructure and advocacy projects. This workshop's focus was on "Complete Streets" which is the design infrastructure and maintenance necessary for all road users to enjoy using the road safely. Each table tackled projects that are slated for construction in Peterborough during the next five years that currently do not have a design. Using cardboard placeholders, the idea was to design the layout of streets such as Chemong, Ashburnham, George and Water to incorporate access for both vehicles, bicycles and parking alike. Each game board had markers to indicate scale so each street layout had to comply with real-world dimensions. Afterwards, photos were taken and the layouts will be submitted as possible designs. Attendees were welcomed to join a tour lead by Susan Sauvé and Urban Design Planner Brian Buchardt. They were treated to a short walk downtown to showcase elements of the current and future design downtown, such as our new footpath beside the train bridge. The evening's events were opened by Donald Fraser who thanked such a passionate and growing number of attendees for coming. A message from Jeff Leal (who was unable to attend) was read that mentioned that the Ontario government is aiming for a 2031 date to both recognize cycling as a core mode of transportation and a goal to make Ontario the Number one province for cycling in Canada. The Ontario Cycling Strategy which was just recently released promotes a healthy and active lifestyle, tourism strategy and health benefits. This strategy will roll out through action plans throughout the coming years, with the first kicking off next Spring. Eleanor McMahon from Share the Road read a letter on behalf of Glen Murray, the Ontario Minister of Transportation and Infrastructure who gave a nod to P-BAC, The Peterborough-County City Health Unit and the Ontario Professional Planners Institute-Lakelands District for their hard work. 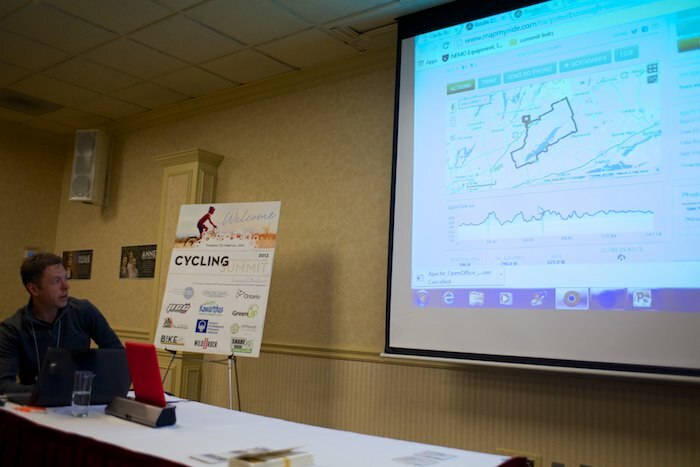 He also echoed the hopes to make Ontario a lead cycling destination. Sue Suavé: The City passed a new updated Compressive Transportation Plan in 2012 which has 183 KM of bikeways in the City alone. They have $500,000 a year to spend on capital to make projects happen such as on multi-use trails and on-road bike facilities. Right now we have 55 km of the network built (30%). Sue showed how over the years our cycling network has expanded. In addition to the trails, we also now have 156 new bike parking spaces within areas such as downtown and East City which brings the total to 629 downtown. Mayor Mary Smith from Selwyn Township and Chris Bradley from Director of Public Works for Peterborough County. Mary pointed out how many County Councillors were in attendance as they are committed to building trails and do the appropriate planning. Chris Bradley: The Transportation Masterplan was recently completed which contained updated walking and cycling processes (which are different between the County and the City). Some of the improvements to come are shared road-lanes (which are already being constructed in Smith Township), paved shoulders, designated striped bike lanes, separated buffered bike off-road multi use trails, and a lot of active transportation planning still to come. Chris shared a sidenote: that when the Public Works Department Building on Armour Road was redesigned for use, showers were added for when people cycled or ran to work. Chris mentioned that they are trying to link the communities and are always trying to consider the needs and the potential for bike lanes (and walkability of the roads). Cycling lanes are suggested for the Gifford Causeway (which runs between Bridgenorth and Ennismore) and reconstruction on Ward Street which is slated to be widened. Input from last year's cycling summit has already gone into the new masterplan. One important area that Chris highlighted was Airport Road. They are just completing the final design now for reconnecting it and the project is moving forward. 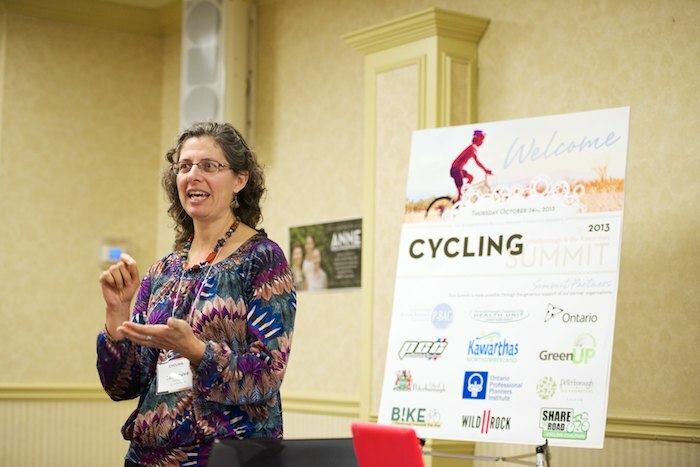 The keynote speaker was Dr. Karen Lee whose topic was "The Role of Design and Infrastructure in Addressing Cycling and Health". She talked about how history repeats itself with the infectious diseases of the 19th century and the chronic diseases of the 21st century. Through infrastructure changes, there was a decrease in infectious diseases, however something needs to be done for our current issues. Dr. Lee displayed a disheartening animation of Diabetes trends among U.S. adults from 1994 to 2009 which also equates to higher medical costs. This trend also applies to Canadians as we aren't getting enough exercise. It was suggested that we could again correct this through infrastructure changes to encourage active transportation and greater access to physical activity. Side benefits included a reduction of infrastructure costs and job creation. Our favourite slide had some Peterborough statistics that compared 1947 to now. While our 65+ population has slightly risen, Peterborough has less people per acre, has more employment in the Service Sector, and the percentage of City's Non-Food Retail Space in Downtown has actually dropped considerably. Be sure to view Dr. Karen Lee's presentation and also take note of New York's Fit-City initiative that has promoted healthy living through design. You can view each presentation on the P-BAC website.